Jakarta : A series of blasts and explosions took place in Jakarta resulting in panic and intense disruption of lives and security of people in the Indonesian city. 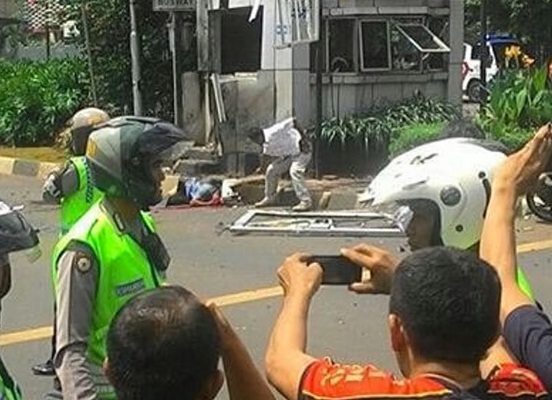 At least six blasts went off in the city center of the Indonesian capital of Jakarta in an apparent terrorist attack involving suicide bombers. People who stood witness to this deadly attack described that the explosion resulted in immediate casualties, and chaotic scenes erupted as people began to run helter-skelter to save their lives from the attack as gun shot were heard in the vicinity since exchanges of gunfire shot off between the militants and police. At least six people have so far been confirmed killed in the attack. The official Twitter account of the Jakarta police said that the explosions went off in front of a shopping center known as Sarinah mall. Police informed that attackers arrived on motorcycles and threw grenades. the situation is chaotic as series of explosions and a possible scenario of terrorists wandering on the streets with loaded guns is not being ruled out. Multiple explosions, and gunfire in central Jakarta has rocked Indonesia as explosions went of near café and in the area of UN agency office. There were apparently 10 to 14 attackers involved in the Jakarta blasts, as reported by local media. Eyewitnesses have reported an exchange of gunfire following the explosions, while at least three bodies were seen lying on the ground. A police officer is among the four dead, as revealed by local authorities. It is being interpreted that at least one suicide bomber set off the explosions, but confirmed reports are trickling down constantly with police on a high alert. Police is still chasing down the roaming attackers and citizens are under a terror grip as an active shooter is reported to be on scene on the loose.